Thomas Cook, the popular UK-based travel agent, announced this week that they were going to take the reins of Essential Travel through the acquisition of Essential’s parent company Think W3. If the deal is approved by the FSA, as expected, it will be a real boon to Thomas Cook’s portfolio of travel services they are able to offer customers. Essential Travel have been around for about a decade and have established themselves as a leading online travel extras provider, with products ranging from travel insurance to airport parking to airport hotels with parking. The company reported gross assets of £2.5 million for the financial year that ended on the 31st of March 2009. “We continue to believe a strong position in the direct travel insurance market is strategically important. What do you think? Should service providers like Essential Travel try to remain independent to prevent just a few big companies from creating a stranglehold on the market? Leave us a comment and let us know. Earlier this week, The Telegraph reported that a Muslim woman was believed to be the first passenger to be prevented from boarding a flight after refusing to go through Manchester Airport’s security scanner for religious reasons. The woman was about to board a flight bound for Islamabad when she was randomly selected to pass through one of the new full-body scanners, designed to detect concealed weapons, explosives or other dangerous contraband. She was warned by security staff that she would not be allowed to board her flight if she did not comply, but she decided to forfeit her ticket. Unfortunately, all the reassurance in the world won’t sway a person to discard their religious beliefs, no matter what the situation. Still, it’s hard to imagine anyone feeling comfortable boarding a flight with the knowledge that a fellow passenger had refused a scan and was still allowed on the plane. Although Transport Secretary Lord Adonis has stated that passengers would not be selected for the full-body scan “on the basis of personal characteristics“, it will be interesting to see what conflicts may arise as the use of these scanners becomes more prevalent in months to come. Tell us what your opinion is of these scanners by leaving a comment. Would you refuse to be scanned for any reason, even if it meant sacrificing your trip? Save a bundle when you pre-book your Birmingham Airport parking, parking at Manchester Airport or Liverpool Airport parking. Book now and save up to 60% off the standard daily rate! John Lennon’s Possessed My Car! After a rather delayed 4-hour flight from Bordeaux yesterday, I eventually got back safe and sound to the UK. 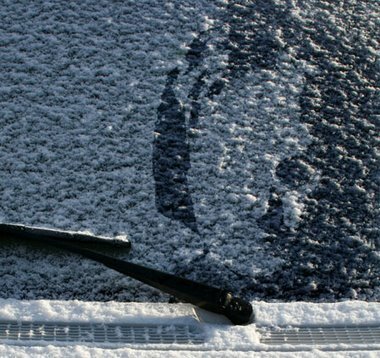 It’s pretty rare to get a “White Christmas” nowadays, so with recent reports about the UK getting its fair share of snow I was pleasantly surprised to see my car covered in a sprinkling. I was pretty tired from the journey, and had to wipe my eyes, but as I approached the car I saw John Lennon staring right back at me. Yes, that’s right, I said John Lennon! Okay, not literally, but by the way the snow had started to thaw on my front window it was pretty much the best effigy of the Beatles great I had seen in a long time. My friends do say I have an over-active imagination, but I was in a Liverpool Airport car park at the time, and I think you’ll agree that the face that stared back at me was pretty close to the real thing. Seeing as the driver’s side door was frozen shut and I was in no rush anyhow, I “tweaked” the ghostly face a little more by pushing the bottom end of my water bottle into the snow to make the left eye more prominent and then sprayed on a right eyebrow. Et Voila! Thrill Seekers…Head to New Zealand! New Zealand is one of the most popular destinations for backpackers. An array of mountains, glaciers and lakes offers an awe inspiring scenery. To anyone who enjoys the great outdoors, this is one of the best countries in the world to take part in outdoors activities. In the space of a week, you can bungee jump, go white water rafting, swim with dolphins, watch whales and hike through a rainforest! Christchurch is the South Island’s largest city. Cathedral Square in the centre of the city is the best place to start your journey. The Christ Church Cathedral which towers over the square is one of the city’s most popular attractions with visitors coming to admire the gothic architecture. For awesome views over the city, climb the 133 steps to the cathedral’s spire to the lookout balconies. Botanical Gardens, situated on the banks of the Avon River. They have a distinct English feel to them and the rose gardens, conservatories and lush gardens collectively make for a very pleasant afternoon. In the evening, head to Oxford Terrace near the city centre where the majority of the city’s best bars and clubs are. If you don’t fancy hitting the bars and clubs, the city has a wide range of top quality restaurants which will suit anybody’s taste. Stop off on route to break your journey to Queenstown. Mount Cook National Park is 3-4 hours from Christchurch and home to Mount Cook, the highest mountain in New Zealand. Before you get to the national park you will reach Lake Tekapo. A visit to this lake is a must. With snow-capped Mount Cook sloping down to its turquoise water, it makes for a very idyllic location. And if you feel in touch with your spiritual side around Lake Tekapo you can visit the Church of the Good Shepard. On arrival in Queenstown, book into your accommodation, relax and recharge your batteries. This small town on the shores of Lake Wakatipu is full of activity so you will need as much energy as possible for your next few adventure filled days. 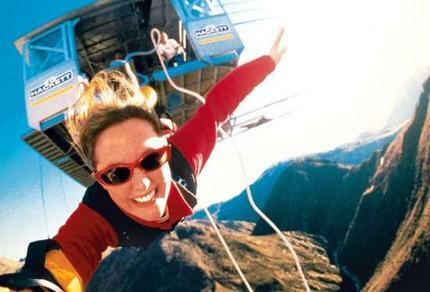 Queenstown is popular with backpackers as it’s a base for so many adventure sports. Some of the adrenaline sports you can do here include bungy jumping, skiing and white-water rafting. If you want to do a bungee jump that is like nowhere else in the world this is definitely the place to do it. AJ Hackett are the flagship bungy company in Queenstown and run jumps from The Nevis Highwire Bungy costing around £106 per adult. The jump pod, purposely made for bungy jumping, stands at 134 metres high – the same as the height of the Sydney Harbour Bridge. With 8 ½ seconds of freefall, the river seems to rush towards you faster than you’re rushing towards it! New Zealand has some of the fiercest rivers in the world, making them perfect for white-water rafting. The Kawarau River is the closest to Queenstown and offer rafters an exhilarating experience while enjoying the breathtaking scenery. Organised rafting tours from Challenge Rafting usually take half a day and leave both in the morning and afternoon costing around £76 per adult. Between rapids you will experience calmer stretches of river, with a great view of the historic Kawarau Bungy Bridge as your raft passes underneath. A day’s rafting through numerous rapids on one of the world’s ferocious rivers can take a lot out of you. At sunset wind down at Lake Wakatipu and gaze at the aptly named Remarkables, a range of ‘remarkable’ mountains at the lake’s shore. 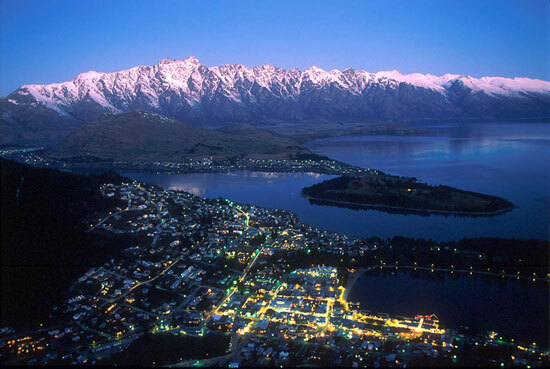 As there is so much to do in Queenstown on the activity front, it is nice to explore this scenic town by foot. Walk along the shores of the lake which begins on Peninsula Street and the walk up to Queenstown Hill. For a bird’s eye view over the town, take a trip on the Skyline Gondola. It climbs up to the top of a hill where you can enjoy the spectacular views of Coronet Peak, The Remarkables mountain range and Lake Wakatipu. 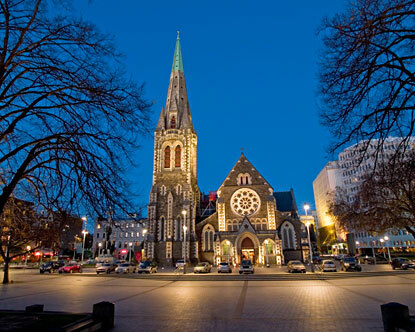 Another chance to see what Christchurch has to offer. A visit to the Orana Park Wildlife Trust is a must. Set in 80 hectares of park-like grounds, Orana Wildlife Park is home to over 400 animals from 70 different species and is New Zealand ’s only open range zoo. The Park is located 25 minutes drive from the City centre, backpackers should make use of the transport service with Sunshine Shuttles between the city and the Park. Two hours drive north of Christchurch will bring you to the sleepy seaside town of Kaikoura, meaning ‘to eat crayfish’. When in Kaikoura, you have to sample some of its famed crayfish – you don’t have to splurge out in one of the restaurants, some of the takeaways also sell some tasty cray fish. The Kaikoura coastline attracts some of the most magnificent creatures, including whales that can grow up to 20 metres and weigh over 50 tons. These whales can be seen all year round making Kaikoura one of the most popular whale watching locations in the world. Book your whale watching trip in advance with the operator Whale Watch Kaikoura for approx £63. For a chance to swim with dolphins in the open ocean. Contact the operator Dolphin Encounter to book your pleace to swim with wild dusky dolphins which occupy the waters around Kaikoura all year round – something which can’t be done in too many places around the world. It will cost you approx £66 to swim with the dolphins or £35 to watch the dolphin encounter. Either way, a truly unforgettable experience! If you really want to enjoy your New Zealand Trip make sure you take out your cheap backpacker insurance. May’s Meccano Bridge…a new world record? When Liverpool clerk Frank Hornby invented his Meccano toy construction kits back in 1901, he never could have guessed that a 21st Century Bristolian TV presenter would use his creation to span a canal near the Liver Building. But that’s exactly what James May did earlier this year as part of his “Toy Stories” series. In September, May unveiled the 75-foot long bridge and proceeded to cross the canal on the 1/2 tonne contraption. It was engineered by Atkins, the design and engineering consultancy and took 20 people more than six weeks to complete (students from the University of Liverpool’s Engineering Department were even roped in to assist). The final product is even believed to be a new world record for the largest Meccano bridge ever built, with 100,000 individual parts – including 28,000 bolts! Now, this got us thinking…with the new expansion taking place at Liverpool Airport, there will undoubtedly be increased demand for convenient Liverpool Airport parking. Soooo…maybe we could get Mr. May to construct a multi-storey car park from the multitude of metal components he apparently has access to, thereby alleviating any potential traffic congestion and providing a relatively cheap solution for travellers in the Northwest. What do you think? Would you park in May’s Amazing Meccano Multi-Storey Car Park? Despite a small percentage decline in the UK winter sports market, early snowfall across the Alps and in the US has seen a flurry of bookings for the 2009/10 ski season. The Ski Club of Great Britain’s annual Snowsports Analysis reports that the UK winter sports market fell by 6% across all sectors in 2008/9. The total UK snowsports market now stands at 1.27 million people. France continues to dominate the market, as it has done for the past few seasons, with a 43% share. Austria increased their market share by 2% and Italy and Switzerland both saw a 1% increase in market share – indicating a small decline in visitors to the USA and Canadian resorts and to Andorra and Bulgaria. Skiers continue to dominate the winter sports market, with the report giving the group a 79% share. 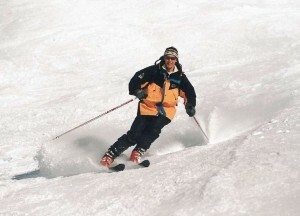 Many online companies have been quick to recognise this trend by offering dedicated skier travel insurance packages. One such company is gosimply.com – whose competitively priced insurance offers a level of cover that’s hard to beat. Featuring dedicated ski and sports equipment, piste closure and emergency transport cover, their Winter Sports travel insurance is well worth checking out if you’re headed to the slopes this season. By searching all reputable and established providers across the country – gosimply offer a huge range of pre-travel holiday necessities such as car hire, airport parking and hotels at the lowest available online prices. For more information visit www.gosimply.com. It’s certainly no secret that organisations worldwide have been actively seeking ways to cut costs as the global recession takes hold. Companies are trying to balance cost control with wider responsibilities such as environmentally sustainable travel. Yet the need to travel remains a fact of life in the business world – building new relationships, maintaining current ones and facilitating growth overseas. Whilst the digital age has certainly opened up a whole new world of communication – it seems there really is no substitute for a good old-fashioned, firm handshake. Annual business Travel Insurance from gosimply.com not only represents excellent value for money, it also includes cover for business documents and complimentary Priority Pass membership – providing access to over 600 airport lounges worldwide – a huge bonus for business people that travel on a regular basis. Also, if you’re making several trips per year, you’ll most likely find that an annual policy offers better value for money than buying separate policies on an ‘ad hoc’ basis. With such a wealth of online deals readily available, this is one that stands out, making it a business opportunity too good to miss. Find your own American dream…..
As consumer taste and expectation become increasingly varied – many tour operators are now focusing solely on unconventional alternatives to the conventional sun, sea and sand getaway. After all, a relaxing holiday doesn’t necessarily have to involve lounging around reading a book in the sun does it? Adventure holidays provide the perfect alternative for the growing number of travellers each year swapping margaritas and sun loungers for thrills, spills and excitement. With some of the most spectacular and diverse geography on earth – America is as good a place to start as any. There are a huge range of experiences for both the young and young at heart – from authentic cowboy camps and wilderness canoeing to UFO spotting and sunrise over the Grand Canyon. Companies such as Trek America have been arranging tours across the US for 35 years, using their experience and knowledge of the local landscape to provide an experience that is second-to-none. For many though, it’s about more than just the thrills – adventure holidays bring together folk from all walks of life and all ages, offering a great way to find new friends on a truly global scale. Whatever experience you choose, you’ll need adequate travel insurance. As usual, the best deals are to be found on the web with companies such as gosimply.com offering adventure holiday insurance packages with a great range of ‘bolt on’ extras, enabling you to tailor your policy to your exact needs – no matter what activities are on the itinerary. And for those of you designing your very own American dream, gosimply offer literally hundreds of US car hire locations throughout the continental United States. 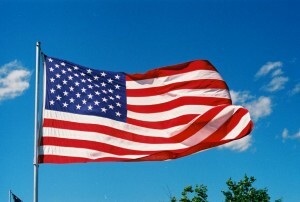 For more information on adventure holidays in the USA – check www.trekamerica.com. For adventure travel insurance, see www.gosimply.com for more details. This post is dedicated to the more intrepid travellers out there – those amongst you who like to get off the beaten path once in a while. I’ve been having a look around at some of the more ‘out there’ holiday packages available across the globe, and I believe I’ve found one that might just whet the appetites of the adrenaline junkies. 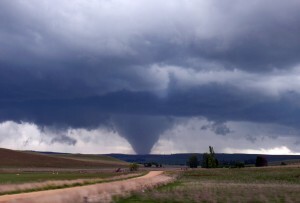 So…how about a little storm chasing? Seriously. When I looked into this bona-fide American pastime, I couldn’t believe the number of websites dedicated to the subject, and for that matter the choice of organised tours available to the discerning crazy person. If you don’t believe me, check out www.stormchasing.com for a peek into the world of professional storm chasing. For those who aren’t in the know, storm chasing involves (as you might have guessed) chasing storms across the mid-western United States. Hold on a minute though – these aren’t just any storms – we’re talking tornadoes here. Storm Chasing Adventure Tours are one of the premier operators in the US, and they’ve been treating thrill seekers from all corners of the globe to a wild ride for over a decade. They currently offer 6 day tours, travelling across a number of states throughout the Great Plains, boasting some of the best storm-chasing technology available. They’re currently taking bookings for 2010 – so why not give it go? You might surprise yourself, and it’ll certainly make for some interesting holiday snaps…oh, and you might want to seriously consider investing in some adventure travel insurance before you go, because you never know which way a twister is going to turn. If you’ve already experienced a storm chasing tour, leave us a comment and let us know if it’s as exciting as it sounds.